Russell Secker: OK, time to get serious! ...and get the ol' blog back into action ready for the M2M Ultra. Today I leave Tulsa for 3 weeks before the race starts in England, taking care of family stuff and hopefully getting in some final training miles in cooler weather. In case you missed the news, Tulsa has languished under record heat this summer. Not just anecdotal - July 2011 was actually the hottest average temperature month ever recorded in the US since records started to be kept in 1895. We had days and days of hot (100F+) and humid temperatures. I've run a decent number of miles and a few races, and done a lot of stationary biking at the gym (in part to escape the heat outdoors), but as usual I'm not as prepared as I would've liked. Brief health check (and early excuses! ): Everything from the knees up is working OK. That's good. Feet are painful, especially the left one, and I've developed a very sore varicose vein above my right ankle. Not so good. But not too serious, I hope. So on September 14th, the M2M Ultra starts - just over a dozen of us covering the length of Ireland from north to south (344.5 miles) divided into eleven daily stages averaging 32 miles each. 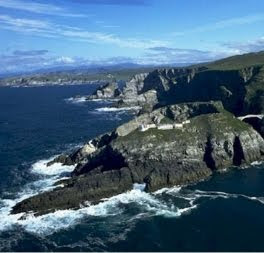 We start at Malin Head in the North, and finish at Mizen head in the Republic. We will fly to Belfast on the day before the race starts, meet race organizers Rory & Jen for the first time, and be whisked to the start on a sleeper bus with our own personal chef. Sounds groovy. Rumor has it that it was once Status Quo's (the legendary hard rock band) tour bus. In a beautiful piece of life's symmetry, this was the first band I ever saw perform live, as a spotty 14-year old at the Wake Arms pub in Epping, England. Like me, they must be getting on a bit by now.